Hi everyone, we’ve finally completed our summer camp schedule! Objective: This camp will elaborate much more on the theme of our Spring Break Camp. We will be working on breaking grips, holds and learning how to disengage from an attacker tactically. Our goal is to teach kids about safe and non-violent ways of dealing with “bullies” including, but not limited to, nonverbal cues to de-escalate situations. Further, we will explore how to defend ourselves in the event we are attacked and how to bring an attacker to the ground to neutralize them. Objective: Where the head goes, the body will follow. This camp will follow up on the same principles as the last one with a big variation; we will mostly focus on the headlock position. We will work on defending ourselves from standing headlocks and ground headlocks in order to safely recover good positions. Our goal is to teach kids how to protect themselves in the event a bully or attacker tries to control them by their heads and get into a more dominant position. Kids will not only learn how to get out of the headlock position but also learn how to use the headlock position as a tool for self-defense. Objective: This camp is going to focus primarily on takedowns leading into control positions and submissions! No fluff what-so-ever! 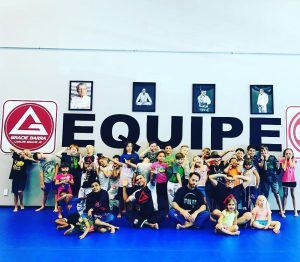 The goal is to teach our camp participants how to go from the standing position, straight to the submission with some pointers on how to control an escaping opponent in between. Muscle memory will be the name of the game here! July 29-Aug 2 Back to School: Anti-Bullying! Objective: This camp will be similar to our Anti-Bulling camp, however, we will focus more on some of the basics of self-defense as it relates to the ground. Here, we will not work from the standing position, but rather we will focus on what happens when an attacker gets us to the ground? If your child, for example, is pushed to the ground, what do we need to do to keep ourselves safe? The goal of this camp is to teach kids how to effectively break their falls and defend themselves off their back (the “guard” position) in order to get back to their feet safely so they can defend themselves from a better position. Our camps are a ton of fun and they do sell out fast! March 18 – March 21: Spring Break Self-Defense Camp: Grip Fighting, Distance Management, and the Clinch! Objective: Teaching our campers the fundamentals of self-defense at the time of engagement. Our goal is to show kids how to disengage from unwanted grabs and pulls, learn how to maintain a safe distance and finally, learn how to close the distance effectively. The camp will end with our students re-engaging into a “clinch” position, leading into the takedown of an attacker to avoid any further striking.